← Uprising in The Villages! 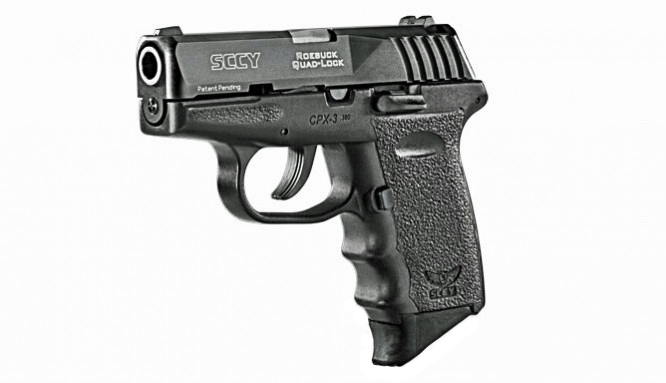 In 2016, SCCY Industries will be coming out with their first .380 ACP pistol, the CPX-3. The Daytona Beach manufacturer’s new handgun will utilize SCCY founder Joe Roebuck’s patent-pending Quad-Lock system to stabilize the barrel and improve accuracy over their previous DAO guns. The Roebuck Quad-Lock will likely be featured on future SCCY’s. While maintaining the general looks of their 9mm Parabellum CPX-2 pistol, the CPX-3 will be just slightly smaller. A CPX-3 holds 10 rounds in its double-stacked magazine, so it will not be a micro-380. Pre-production photos show the “Dash 3” obviously bigger than a Ruger LCP or Kel-Tec P3AT. For those who feel those latter guns are tough to grip and control, the CPX-3 will be a palatable addition to the .380 market. When I reviewed the SCCY CPX-2, I had a bit of concern over the quality of a then-sub-three-hundred-dollar blaster. My fears were unfounded and my CPX-2 has performed without quarrel in igniting over 600 primers. I hope the new gun functions with this exceptional reliability. MSRP for the SCCY CPX-3 is expected to be $339.00. More to come. This entry was posted in Concealed Carry, Firearms, Florida Companies and tagged Concealed Carry, concealed carry gun, Police Back-Up Gun, Sccy CPX-2 Review, Sccy Industries. Bookmark the permalink. The CPX-3 doesn’t exist, and was never going to exist. The “Roebuck Quad-Lock” doesn’t work, and SCCY refuses to admit it, knowing that it would destroy what little positive reputation this dumpster fire of a company actually has left. Randall. Since you wrote the article can’t you go to CSSY and ask the top brass when this gun will be available? Got tired of waiting, bought a Glock G42, love it.